Dubai, Nov 30th, 2009 (WAM) — Two of the best speed climbers in the world are set to thrill the crowds by racing against the clock in Dubai next month, as part of the first dedicated outdoor adventure and sporting event in the United Arab Emirates. The men’s International Federation of Sport Climbing (IFSC) world number three Makysym Stienkovyy, from Ukraine, and the women’s IFSC world number two Anna Stenkovaya, from Russia, will be wowing the crowds as they race each other to the top of a specially constructed climbing and abseiling wall during Outdoor Adventure Dubai 2009 from 17 – 19 December 2009. 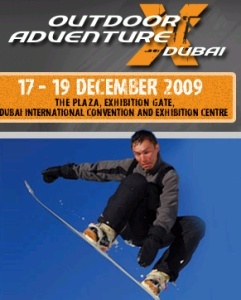 With a natural synergy between those passionate about an outdoor lifestyle and those with a love of the motoring industry, visitors to Outdoor Adventure Dubai 2009 will also be able to take in the 10th anniversary Dubai International Motor Show which runs from 16-20 December 2009 at the Dubai International Convention and Exhibition Centre. “By coming face-to-face with an international line-up of some of the best sports climbers and a world record holding rally driver, Outdoor Adventure Dubai 2009 will ignite a passion for an outdoor lifestyle among visitors to the show. The ‘try before you buy concept at the show will also allow visitors to use all of the products on show and get a taste for outdoor adventure during an action-packed three days,” said Trixee Loh, Senior Vice President, Dubai World Trade Centre. Intrepid rally driver Hesham Nessim, who recently smashed all records by driving his vehicle across the Egyptian western desert twice in an astonishing 13 hours and 33 minutes for a new Guinness World Record, will be interacting with visitors at Outdoor Adventure Dubai 2009. The challenge was sponsored by The Egyptian Tourism Authority to promote the desert’s natural beauty, archaeological wonders and Bedouin culture. “Most visitors to Egypt stay in the cities or resorts, but not many venture out into the desert,” said Amr El Ezabi, Chairman, Egyptian Tourism Authority. “We want to tell people that you can have a totally different leisure experience away from the Pyramids and The Nile.” Visitors will also be able to emerge themselves in the latest snorkelling and dive gear in a special dive pool, compete against their friends to a shoot out at the Ultimate Paintball challenge and experience urban dance culture in the UAE with the first National BBoy breakdancing championships, organised by URS. In addition, the traditional delights of Dubai can be rediscovered at a Heritage Village run by the Government of Dubai Department of Tourism and Commerce Marketing (DTCM), the show’s official event partner, where there will exciting falconry displays, traditional houses brought back to life, local handicrafts and a wide range of other activities. “The show is the first complete outdoor adventure and sporting event of its kind to be held in the UAE, featuring companies, agents and distributors representing some of the biggest international consumer brands. The show is being staged in a venue with dedicated features which will allow visitors to try out the newest sports and outdoor equipment,” added Loh.